I got a bunch of lemons from a friend in Master Ken's class a few weeks ago since my lemons aren't quite ready. I wanted to make some pickled lemons because it's a good way to preserve lemons for later use whether in cooking or just eat them straight. In addition to loving anything spicy, I also love anything sour. My love for sourness is probably what's saved me from gaining much weight in the last 20 years even though I usually eat like a horse. I started out with 6 lemons. Myers lemons are desired by most, but I don't have those. I got a bunch of combination lemons, some with thick rind. It doesn't matter what kind you use really. I scrubbed the lemons and washed them clean, cut off both pointed ends, and cut each of them in half lengthwise, starting from the tip but not cut all the way. The lemon are attached at the base. I made another cut in a similar manner, so now the lemon was quartered, but again, attached at the base. I got 1/2 cup of kosher salt, and put some of it in the bottom of the clean glass jar. You could sterilize the jar by boiling it in water. I didn't do that. I figured with all the salt and acid from the lemons, no bacteria can survive in the jar. If you wanted to be extra careful, feel free to sterilize the jar first. I rubbed the salt into each lemon between the cuts then stuffed them into the jar. After the jar was filled up with lemons, I dumped the rest of the salt into the jar. Now I realized that there's empty space in the jar between the lemons. Ideally, there should be no empty space. You could pack in more lemon and/or fill it with fresh lemon juice. I needed more lemons, so I ran over to my neighbor's to pick a bunch more. I cut the additional lemons in halves to squeeze out the juice into the jar. The jar is filled half way with fresh lemon juice. I left a lot of lemon pulps in there. I like pulps in my juice, but if you don't like them, you can strain the juice first to remove the pulps. I expect more liquid will come out of the lemons as the salt works its way. I am leaving the jar in a shady cool spot for a couple days to observe. I may add more lemon juice as needed if the jar isn't filled with liquid in two days. After that I will store the jar in the fridge. When the lemon rinds become soft, they are ready. It takes about 3 weeks. Before using the lemons, the salt needs to be rinsed off; otherwise, they would be too salty. You can also add spices to the lemons for preserving - cloves, coriander seeds, peppercorns, cinnamon stick, bay leaf. The winter and rain have both returned to the Bay Area this week. In fact, it's going to rain the entire week! The thermometer shows 58 degrees right now, but it feels a lot colder. Last night I put on some gloves under the blanket before falling to sleep. The rain is good for all of my plants, but I hope they don't die from the cold. This morning before it started raining again, I went out there to check on everyone. I got some oregano clippings from the herb garden on Sunday, so I added them to my herb pot. Herbs are usually very easy to grow. I have stuck some leftover fresh herbs from super market, and they just started growing and flourish. I had friends giving me some clippings from from their yards, and they all now live in my herb pot. The only one that didn't survive from last year was sweet basil. They all died off from frost. I will try to grow some again this year and keep some in a small pot so I can bring it inside on cold nights. People sometimes ask me where I got my Hello Kitty charm that's attached to my cell phone. This special limited edition of Hello Kitty charm was sold during the sixty-first National Arbor Day Festival that was held on May 23, 2010 in Kanagawa Prefecture, which is part of the Greater Tokyo Area. My brother and his wife were taking their annual vacation in Japan last year and brought it back for me as a souvenir. They knew if I'd like anything, this would be it (other than food, that is). Who else would be better to promote a national festival than Hello Kitty, Japan's tourism ambassador? Come to think of it, I have no idea what day is our own national arbor day. Do we even have one? I know the City of El Cerrito holds annual Earth Day celebration and get the community to plant new trees. I planted a little cherry tree in December. I think Sand Village Farm is reaching its maximum capacity of trees, but I suppose I can keep a few more dwarf fruit trees. Remember those mulberry scions I planted last month? They are doing quite well, so I will soon have 5 little mulberry trees. 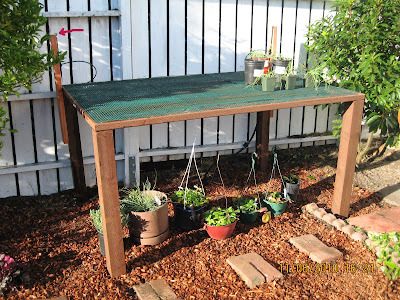 Back in November when Backyard Food Gardens built a propagation table for me, the hat sprays he had were for 360-degree directions. Half of the water was spraying on the fence next to the table. Josh of Backyard Food Gardens told me that I could get a couple of those hat sprays at quarter jet (90 degrees) from The Urban Farmer Store. The Urban Farmer Store is conveniently located all the way down the street from Sand Village Farm right next to American Soil and Stone, where I visit periodically for some of my supplies. Of course, I never noticed until Josh pointed it out to me. 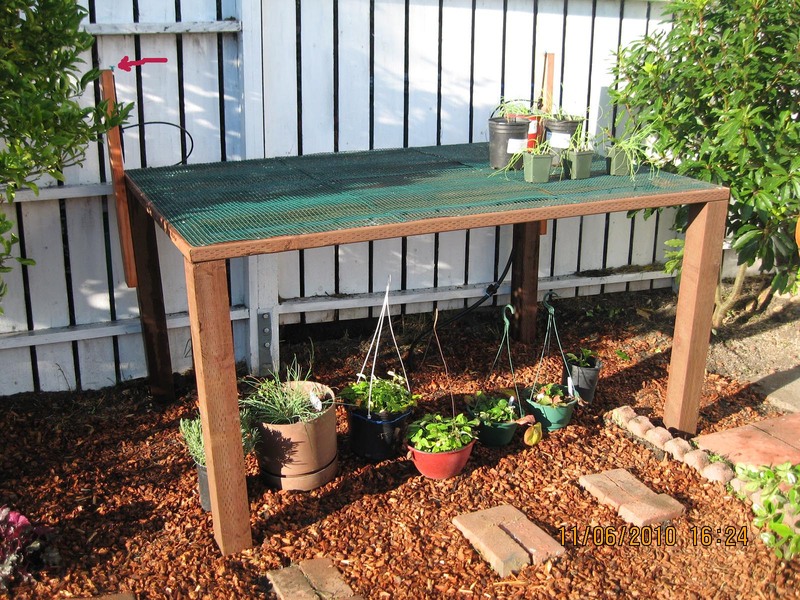 The Urban Farmer Store has everything you need to set up irrigation systems, ponds and fountains, rainwater storage, and outdoor lighting. They also have many gardening tools. If I had money to blow, I could go crazy in there. They also have workshops teaching people how to do it yourself! California is known for its long drought years, and this winter we had only 2 weeks of rain. As a grower, I try to conserve water whenever possible, and there's a lot more I can do. I will start looking for some rainwater barrels for next rain season. The Hat Jets are 74 cents a piece plus tax. They shall save me some water. Maxi Jet Hat spray. The Hat Spray Jets come in full (360), half (180), and quarter (90) variations. It seems more and more people are wheat sensitive these days. When I first brought mochi cake to Master Ken's class, people were pleasantly surprised, and it became an instant hit. Other people have started to look for mochi recipes to try. Last Sunday was the first day of Spring semester, and George brought a basket of matcha (green tea) mochi cake that he baked in mini bundt pan. They were so cute and delicious! They were all gone in minutes. After chatting with George about the recipe he used, I started thinking about how I could experiment with it. Instead of using matcha powder, I thought I would try candy cap powder. I cut back the amount of sugar from the original recipe because candy cap mushrooms have a very sweet aroma that's similar to maple syrup or butterscotch. I also used only half can of coconut cream so the coconut smell doesn't overpower candy cap. In a large mixing bowl, whisk together mochiko flour, sugar, baking powder, candy cap powder and salt. In a separate bowl or large measuring cup (4 cup capacity), beat eggs, then add coconut cream, evaporated milk and melted butter. Carefully pour the wet ingredients over the mochiko flour mixture and whisk until mixture is smooth and uniform in texture. Pour batter into the pans or molds. A silicon mold is highly recommended. If you don't have a silicon mold, be sure to use mini muffin liners unless you are 110% sure your pan is non-stick. Bake for 45 minutes, until top is golden brown and the cake begins to pop out from the mold. If you are using a 9x13 cake pan, bake for about 90 minutes instead. Allow cake to cool for about 10 minutes on a rack and then pop them out from the molds to cool completely. Can store mochi cake for three days, covered. I baked my first batch using the mini muffin pan, and they would not come out of the pan without a fight. I thought about the silicon square mold that I got last year but never used, and this was the perfect situation to use it! The mochi cake expanded as it was being baked. They popped out from the mold but once they were removed from heat, they went back into the mold. I took them to Master Ken's class today, and again they were an instant hit! When they are all golden brown on the top, they are done! I checked out The 11th Hour DVD from the library and watched it again. As I Googled for the speakers in the film, I stumbled upon Dirt! The Movie, which is available for viewing on Hulu.com (free of charge in case you are not familiar with Hulu.com). 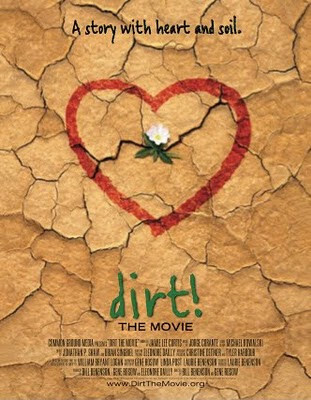 I am no stranger to dirt, but it is always good to see a full length film to remind myself what I am doing is important even though it may be labor intensive or seem trivial at times. There are several environmentalists who appear in both The 11th Hour and Dirt! The Movie, including Paul Stamets, an American mycologist, author, and advocate of bioremediation and medicinal mushrooms. Being an amateur mycologist myself, I am somewhat familiar with his work and surprised how often I see him in documentaries. The movie is informative and cute. Some of us know that fertile dirt is alive and full of organisms even though most of them are invisible to the naked eyes. 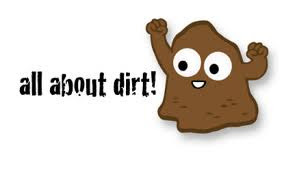 For that reason, there is a little animated character in the film to symbolize living dirt as shown in the image above. I was also pleasantly surprised to see El Cerrito being mentioned in the film! Kevin Rowell and Marisha Farnsworth of The Natural Builders are featured in the film as they are laying the dirt floor in the bedroom of their cinder-block garage home. I guess their home is in El Cerrito. The floor they install in Dirt! is made of earth excavated from beneath the topsoil, amended for a proper ratio of sand and clay and fortified with horse manure. That last ingredient may dissuade the squeamish, but horse manure really is amazing stuff. If you want your fruit and vegetables to grow well, add some horse manure to the soil. It doesn't even stink. It's basically digested hay since that's what horses eat mostly. The film also interviews Alice Waters of Chez Panisse Restaurant, who started Edible Schoolyards in Berkeley. I wish I was introduced to growing food and the magic of dirt earlier in life, but I can doing quite well passing the information to others who are just now beginning to take an interest. 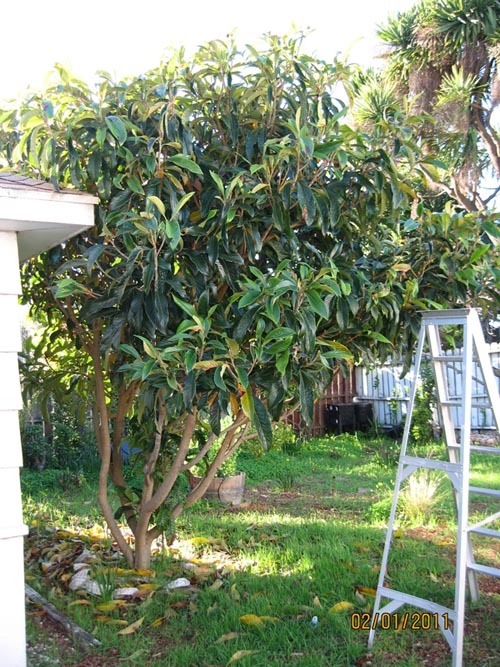 I have wanted to cut back the loquat tree for months. Time is running out since pruning needs to be done by early spring before the fruit tree starts to bloom. This afternoon I grabbed the ladder, pruning shears, and the Silky Pocket Boy, to get to the business. According to Wikipedia, loquat tree is an evergreen large shrub or small tree. In my case, it's the largest shrub and tree on Sand Village Farm. Since it's evergreen, it never goes dormant like the peach and apple trees. Loquat's large waxy leaves are falling all year round and they take years to decompose. I made the mistake of filling up my compost tumbler in December 2009 with loquat leaves, and they still haven't fully decomposed. As I started to prune the tree, I found several clusters of flowers. I made sure that I didn't cut them off by accident. Although this tree is quite large, it produces very few loquats. I am not sure whether it was because it was grown from a seed or just lack of pruning. In addition to low production, the squirrels and birds tend to get the loquats first. I tried to thin out the tree for several reasons. By thinning the tree, hopefully, more energy will go into producing fruits instead of growing leaves. Secondly, it would be a littler easier to pick the fruits if I am lucky enough to get a few.